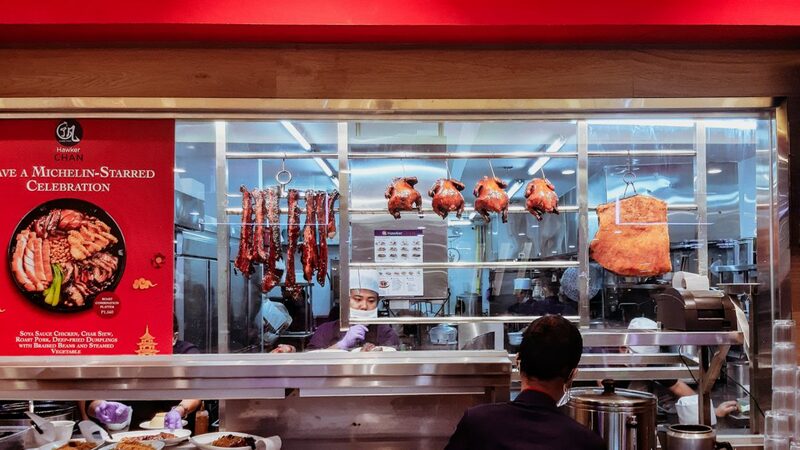 Another Unlimited Korean BBQ restaurant is in the block! 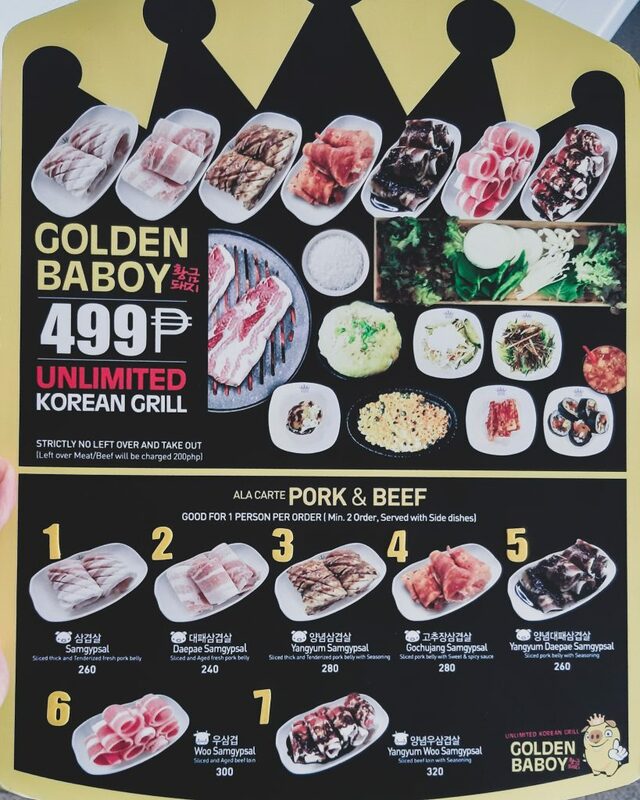 Here is a review of the GOLDEN BABOY Unlimited Samgyupsal Korean BBQ along Mindanao Avenue, Quezon City. 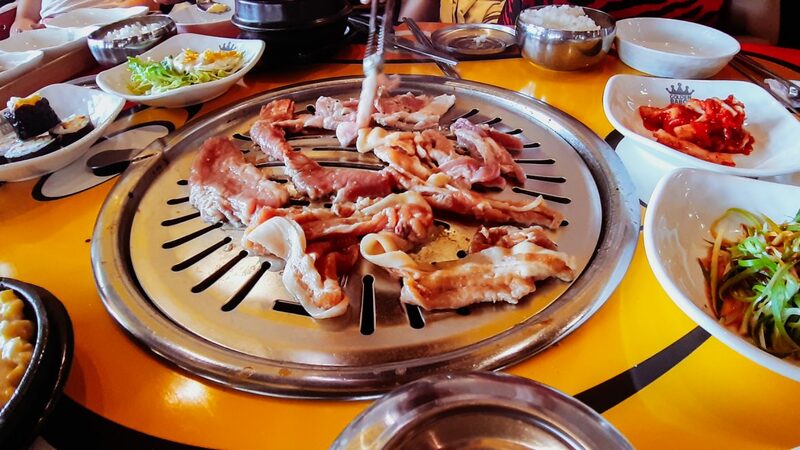 They claim to offer the real taste of Korean unlimited Samgyupsal that has been deliciously crafted by a Master Chef in Korea named Masterchef Nam Sang-moo. Quite exciting! My sister got some discount coupons from MetroDeal for my nephew’s birthday by the time we had gone to the place. It was on a weekend, and there was a line forming by lunchtime. 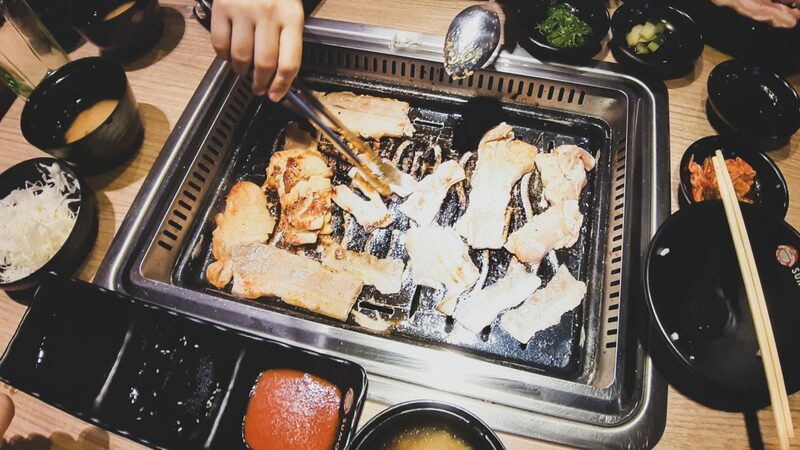 For the price of PHP 499, you can get a taste of all their meat variants for the best Unli Korean BBQ Grill Experience! The very first thing that caught my attention is the fact that THEY GOT CHEESE! And it’s not something pre-mixed, it’s not in its fondue state. Rather, it is in its purest state as CHEESE, and it was Mozzarella during our stay! Did that come through? I really wanted that part emphasized as I’m a cheese-fanatic myself. Haha. They also offer other side dishes like kimbap, kimchi, corn cheese, egg stew. They have the staple sesame oil, gochujang dips as well as lettuce, and other vegetables. The table truly is a happy sight to see. Everything’s in overflow, and the whole experience was worth it! 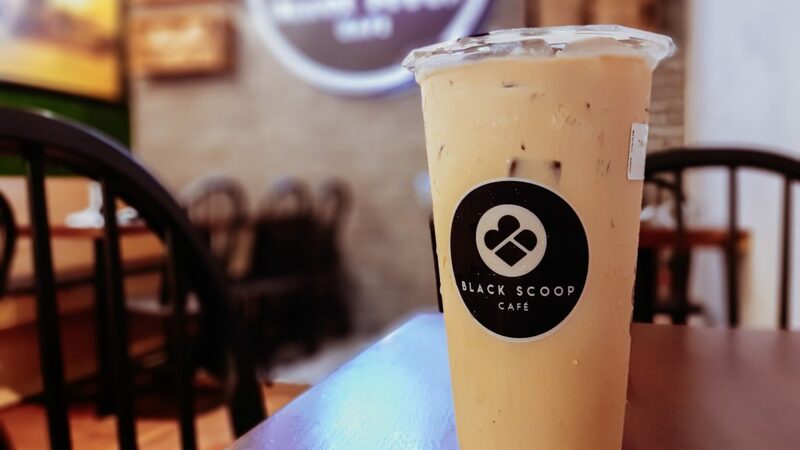 They have clean black and yellow interiors, attentive and accommodating staff, and a comfy place to just have fun with family/friends for celebrations! Kudos to the whole staff for being so attentive, and for being proactive by providing grill replacements, meat/side dish/vegetable refills, water refills, and so much more especially when needed! The Golden Baboy Experience did not disappoint. I felt that I BECAME THE GOLDEN BABOY for BEING SATISFIED figuratively at the end of the day. It was such a delicious, memorable experience! Haha. 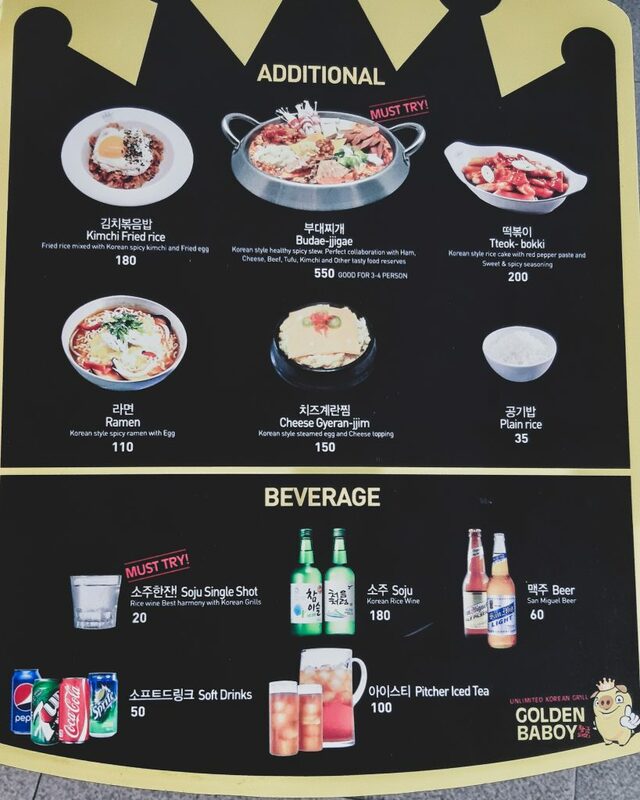 It was said that the owner built this Korean Samgyupsal BBQ joint with a goal in mind — to let Filipinos experience the real taste of Korean Samgyupsal. 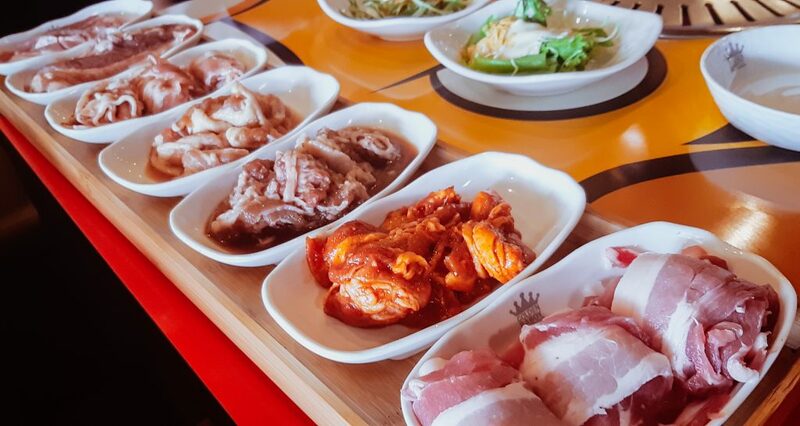 The owner also hired a real master chef in Korea named Masterchef Nam Sang-moo to craft the most delicious and mouth-watering Samgyupsal. ITs great learning about other cultures food and resturants. Wow… I’m getting hungry from reading your post… I never try Korean BBQ before but it looks absolutely amazing. A bit too pricey for me but I will try this out on a special occasion. Thanks for sharing. That’s awesome that they had cheese. I am a big cheese fan. Kimchi fan too! I love Korean BBQ. It’s such a fun dining experience that really brings the senses to life.